As I reflect over the past 10+ years of my life, it is evident that God has been preparing me for this transition to Sports Friends for a long time. As a former Division 1 athlete, it seems obvious why the world of sports is dear to my heart. 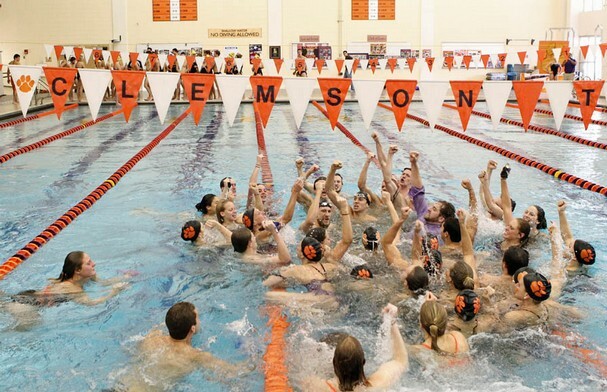 Swimming taught me so many lessons about self-discipline, perseverance, hard work, and, most importantly, the value of teamwork and a strong community. Without the endless support of my parents, teammates, and coaches my swimming career would have amounted to nothing. I truly believe that I learned how to build and maintain genuine friendships through participating in sports. To this day, all of my closest friends from high school and college are girls that I swam with. Swimming also gave me an opportunity to develop healthy relationships with adults other than my parents. I’m convinced that having a slew of adults who loved me (sometimes with tough love!) and invested in me helped me develop self-confidence and a positive sense of self-worth. I believe whole-heartedly in the power and importance of community, and participation on a sports team is one way adolescents can begin meeting the need we all feel to be a part of something bigger than ourselves. Okay, so that explains my interest in sports. What about the international ministry component? 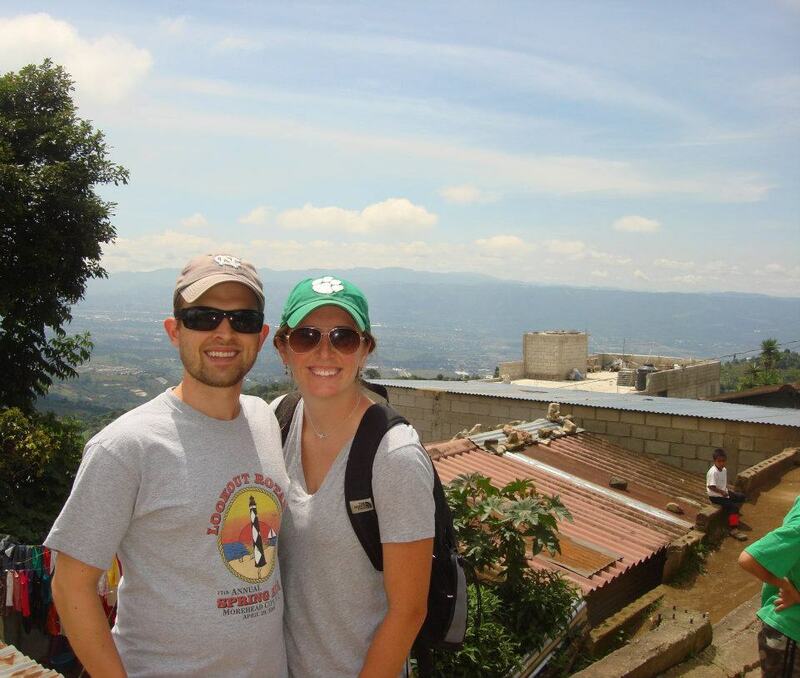 In June of 2012 TJ and I took a trip to Guatemala with our church, Watershed. It wasn’t the first international mission trip we had taken together, but the previous one had been several years before in 2007. 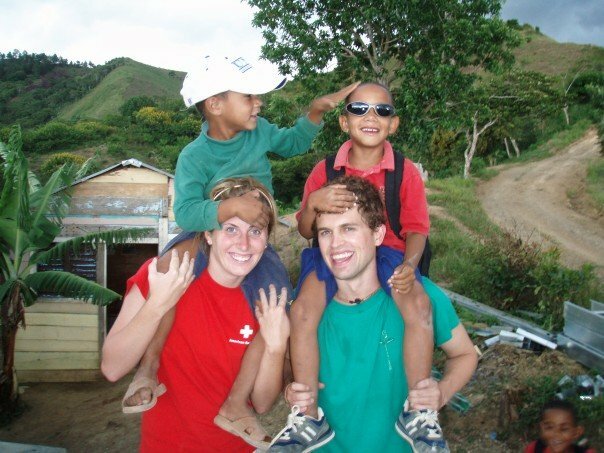 Our trip to the Dominican Republic in 2007 definitely sparked my interest in international service, but at that time I was a rising junior in college and had other priorities dominating my thoughts and energy. TJ and I in the DR. Can we all just pause for a moment of silence in honor of TJ’s wildly curly hair in those days? Thanks. Our trip to Guatemala, on the other hand, awakened something inside of me that couldn’t be silenced. It was clear after that experience that God was calling me to international ministry in some capacity. I felt more alive and more myself in Guatemala than I could ever remember feeling before, and for months after our trip I agonized over how to replicate that experience. At that time I was teaching in an elementary school that I loved, working with amazing educators and wonderful students. It was the best teaching situation I could imagine for myself, and yet I still felt like something was off-balance in my heart. The best way I can explain it is to say that teaching felt like trying to fit an oval peg into a round hole. Not a square peg, because there is so much about teaching that I love and it was a great fit for me in many ways. But there was something just a little misshapen about the way it felt. Through lots of prayer and reflection, I finally recognized that unsettled feeling as God calling me out of the classroom and into something different. Unfortunately, I had NO idea what that something different might be. For a few months TJ and I wrestled with the idea of moving overseas for a season. By Christmas 2012 God had closed the door on that, so I was left to explore options locally. When I stumbled upon Sports Friends, I was actually searching for something part-time. I had an interview scheduled for a counseling graduate program, and the school I was interviewing with is located near SIM, Sports Friends’ parent organization. Most of the classes for the program were to be held at night, and, control-freak over-zealous planner that I am, I was already searching for something part-time I could do during the day if I got in. Ha! Sports. Kids. International Ministry. Huh… that’s weird. It’s like this job was made for me or something. I went to my final interview for graduate school and God all but wrote me a flashing, sparkly letter across the sky. There was a moment during the whole-group portion of the interview day when I started feeling like I was suffocating. It was like an alarm system was triggered in my brain and I couldn’t remember the security code to shut it off. What am I doing here? This is NOT right for me. As soon as I walked out the door I felt like I could breathe again (for the record, I did stay for the whole interview at least…). It was among the most lucid moments of clarity I’ve ever had. I had withdrawn my application by the end of the week. I resigned from teaching in June 2013 with lots of tears and mixed emotions. While I know I am exactly where God wants me, it was hard to say goodbye to the only profession I’ve ever known. I learned more from being a teacher than I ever could have dreamed. I’d be lying if I said I haven’t had any doubts during this stage of my life. There have been moments when the reality of what I’ve done makes me a little dizzy. That I traded in my stable, respectable job for the unknown… that’s just a little crazy! This is a serious step of faith for TJ and me. Faith that God will provide for us during a period of one-salary income while I’m going through training. Faith that there are people out there who will believe in me and in this organization and will tangibly display that belief by the generous offering of their finances. Faith that I will be fully funded and able to start working sooner rather than later. Faith, faith, faith. BRING IT ON, because it’s worth it. This is an answered prayer. Sports ministry has always been on my heart but even after so much research I had not yet found a missions organization that I am drawn to. I am on the Sports Friends website now and I can’t believe it, but this is exactly the type of ministry I have been searching for. I would absolutely love to learn more. I was also a college student-athlete, as was my husband (that’s how we met). We both still work in sports–he is a tennis coach and I work in college football doing communications and administration.